23 Dec 2012: Happy Festivus! After 72 hours of almost continuous rain, the weather was good on Sunday and I made good progress with slating on the south wall, getting it all finished. 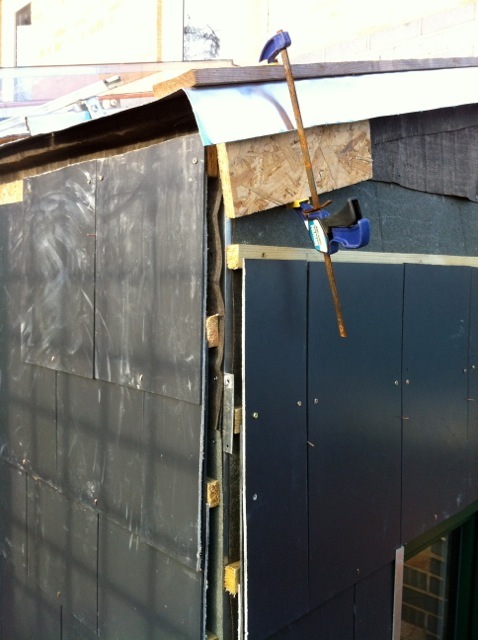 East corner, about an hour before being finished: the vertical corner looks 'open', but there is an aluminium angle section about to go in there, riveted to the aluminium tabs. 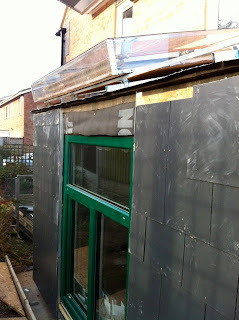 The angle will also be the fixing location for the gutter. I really want the gutter to be up and working because the exposed timber parts are very damp in all this rain, when rain is free to drop off the roof onto the ground, and the ground line needs protection. 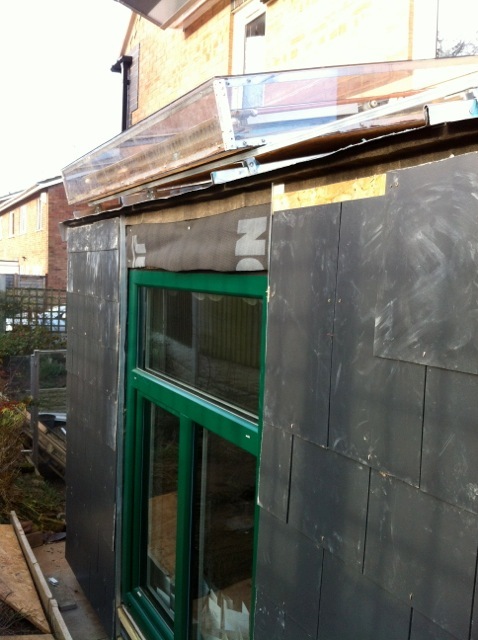 The slating is not quite finished in the foreground and it is finished in the left hand panel, but later, I noticed that there is one defective slate half way up the window on the left side, so had to spend nearly an hour taking slates off above the defective one, to replace it. That's the rule with slating: everything above has to come off! Plumbing note: The Sunbox is now working, although we are waiting for some sunshine. On this day of sun, it was turned off because I need to check the joints in the loft. I have been afflicted with leaks in some of the compression joints in the loft, but the joints in the Sunbox here seem all to be dry, for which I am very grateful!